Fortnite: Battle Royale’s fifth season is racing quickly toward the finish line. 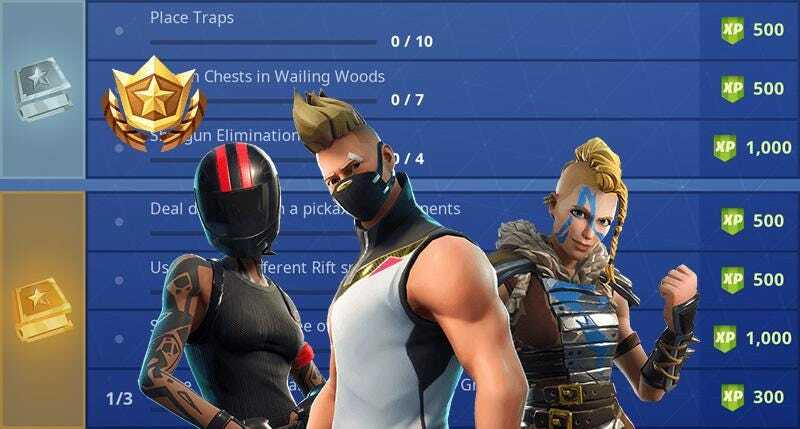 For Battle Pass owners and free players alike, Fortnite has yet another week of challenges to overcome. Here’s what those are and how to solve them. This week players are tasked with yet more treasure chest searching, enemy eliminations and a very unique “search between” challenge. This is the second week in a row that we have a “Stage 1” challenge. That will morph into stages 2, 3 and so forth. Each new stage will be a new location to nab an elimination. That keeps things more interesting, but it certainly makes them more challenging as well. According to leaks, the next phases of this challenge take place in Lonely Lodge and Fatal Fields. Here’s where to search between three oversized seats. Here’s where to use 10 different rifts and where to find the spawn locations. Check out the week 8 loading screen here. 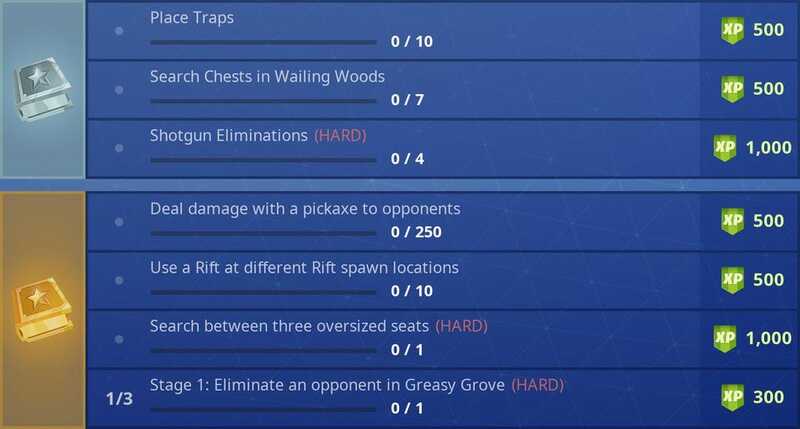 The rest of these challenges are pretty self-explanatory. Wailing Wood has chests scattered throughout the area, and even if you can’t open 7 in one match you should be able to traipse around over the course of two or three and find enough chests to satisfy the challenge. Your best bet is to go to the maze at the center of the forest where you can find up to 5 chests at a time. Four other chests are scattered about the forest. One in the southwest, one in the northwest and two along the eastern edge. There’s another chest on the hill just to the east of the woods. Three more chests can be found outside of the forest on the northwest portion of the area, one along the road and two more up along the hills. Shotgun eliminations are some of the easiest in the game, so head to Greasy Grove with a boom boom stick and get your first one by killing two birds with one stone. The best way to deal pickaxe damage, meanwhile, is to load up the 50v50 Solid Gold LTM and whenever you down an enemy, whack them with your pickaxe until they’re eliminated. It does take a while, but if you have the opening this is the quickest, easiest way to wrap up this challenge. The simplest of all is the “place traps” challenge. There’s nothing specifying that you have to actually use said traps, either as a means of propulsion or dealing damage. Just find what you can and lay them down as quickly as possible and you’ll finish this one easy peasy.